Father's Day is coming up and most men want something practical that they can use every day. Not just something that sits in their closet or desk for years on end without being thought about. So if you want to give Dad something he will LOVE and use every day, then let me recommend Trakline Belts by Kore Essentials. This belt is so unique, comfortable, easy to use and durable - all characteristics any man will LOVE!!! Instead of belt holes – Trakline uses a simple, hidden track with over 40+ size positions to adjust with – all in ¼” increments. In the other corner, most “regular belts” have just 5 holes, a full inch apart. The result = Trakline is 8X’s more adjustable, giving you a precise fit every time, and there’s no belt holes to stretch, crease, or add to. Ouch, that had to hurt. Sorry regular belt. These belts are built to last. The belts are premium Full-Grain Leather (the highest grade of leather). Full-grain actually improves with age, conforming to your waist shape. The belt buckles are constructed of either solid stainless steel, or high-grade zinc alloy, depending on your choice. Plus, they are so easy to use! Trakline leather belts fit any waist size from 24” up to 44” (XL sizes to 54"). Try on the belt, then trim off the excess leather (using household scissors) to attain your optimal size range. Then the 10" track creates a precise fit as your waist fluctuates in and out every day. 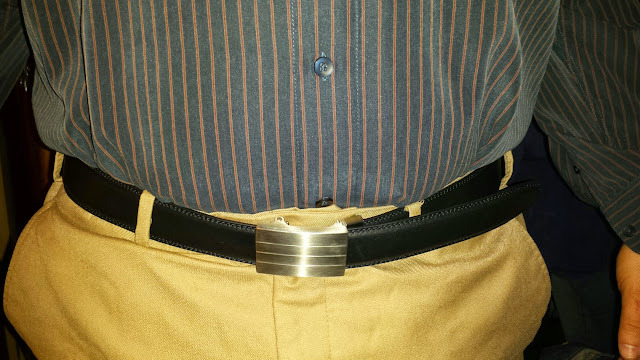 I gave my husband the BLACK EVOLVE BUCKLE & BELT (STAINLESS STEEL) for his birthday and he absolutely LOVES IT! He has lost over 20 lbs recently and so his belts were way too big and had no holes left to adjust to. When I gave him this belt for his birthday, he instantly loved the ingenuity and the style! He is so happy to have NO MORE BELT HOLES! He loves how easy it is to use and the precise, comfortable fit, that snugs to your exact waist size every time, no matter what you ate for lunch. And the discreet release tab under the buckle allows you to easily adjust, or remove entirely with the touch of a finger. It is so easy to use and so modern and sleek looking! This particular belt has the EVOLVE solid stainless steel buckle face. The belt is Full-Grain leather, the outermost part of the cowhide and the best available grade (XL belts are Genuine Leather due to the length). It is perfect for dress, work or play. He can wear it to work, around the house or out on a date with me! 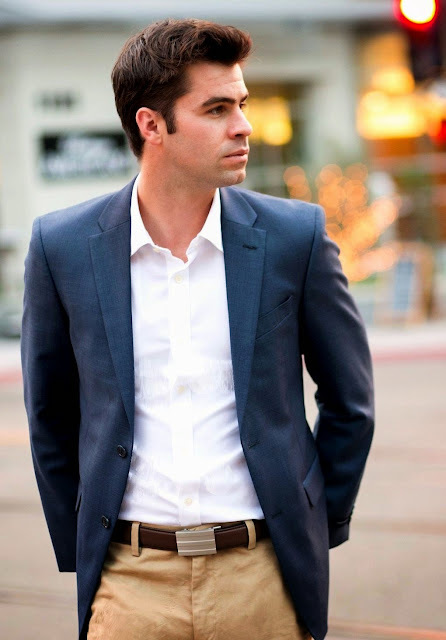 At last, a men's belt that's smart, simple, and stylish for dress, work or casual situations. You can purchase Trakline Belts by Kore Essentials from the Kore Essentials online shop. Make sure to use promo code Save15 at checkout and save 15% on all items! Thanks for the fabulous review !